For one-day protest by CM Naidu, did Andhra govt spend Rs 11 cr from exchequer? A government order sanctioned an additional amount of Rs 10 crore for the welfare of protesters, on top of an earlier sanctioned Rs 1.12 crore. Even as it came to light that the Andhra Pradesh government spent Rs 1.12 crore from the state exchequer to transport protesters in two special trains to New Delhi for a one-day fast led by Chief Minister Chandrababu Naidu, a new Government Order has revealed that the protest may have cost the state a lot more. 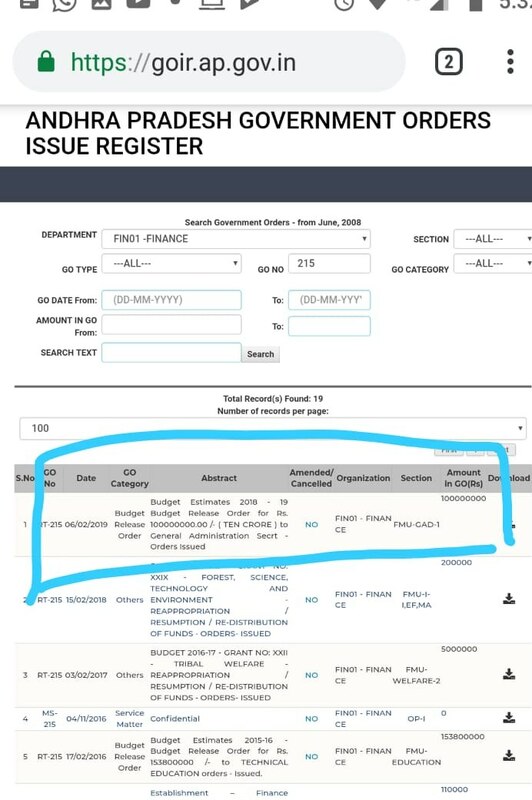 The GO dated number 215 and issued by the Finance Department, sanctioned an additional amount of Rs 10 crore for the welfare of the protestors, taking the total bill of the protest organized by the Telugu Desam Party (TDP) government to Rs 11.12 crore. The GO was signed by Ravi Chandra Muddada, secretary to the government (expenditure) and was also uploaded on an official website of the state. However, in a clarification, the Andhra Pradesh government claimed that only Rs 2 crore was spent on the protest and the remaining amount was for ‘other state functions’. 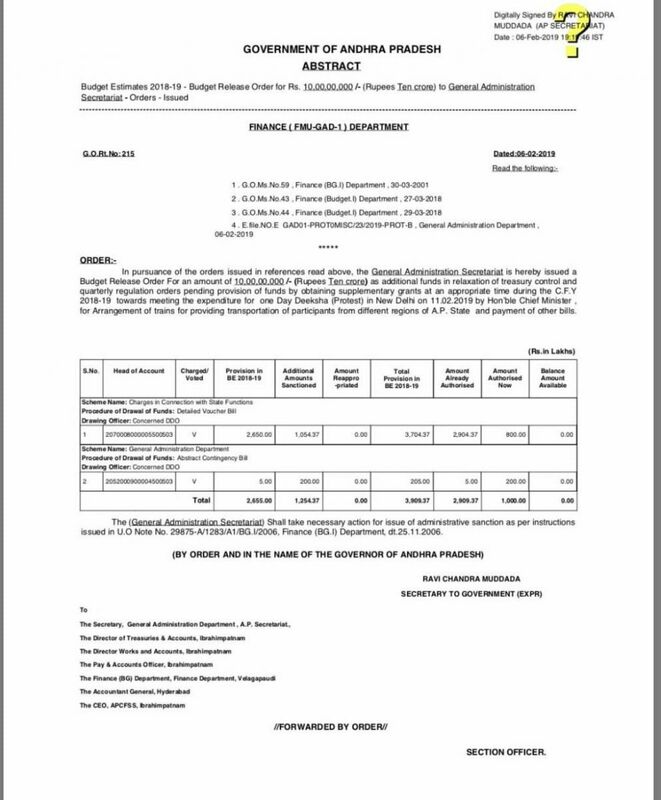 “The Budget Release Order (BRO) issued refers to provision of Rs 8 crore for Other State Functions and only Rs 2 crore for Deeksha. The opening para mentions the same and the allocation is also made as such in the table. It is further clarified that out of provision of Rs 2 crores, GAD has issued about Rs 1.23 crores - 3 bills amounting to Rs 1.12 crore, Rs 10 lakh and Rs 1.3 lakh only. Remaining amount of Rs 77 lakh is a provision for any final bills,” the clarification stated. "Modi is threatening everybody -- opposition, bureaucracy, corporates and even the media. He is using the CBI, the ED and the IT Department to crush the opposition and dissent," said Naidu, adding, “We want to save democracy. Today there is a democratic compulsion for all political parties to join together to save the country."